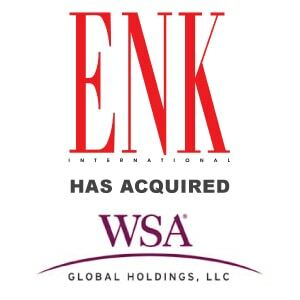 Berkery Noyes Represents WSA Global Holdings LLC In Sale To ENK International - Berkery, Noyes & Co., LLC. NEW YORK, December 19, 2007 — Berkery Noyes, the leading independent investment bank serving the information, media and technology markets, announces that it represented Encino, CA-based WSA Global Holdings LLC (WSA) in its sale to ENK International. Terms of the transaction were not disclosed. The combination of ENK’s position in the fashion market, with WSA’s leadership in the footwear and accessories niche, strengthens the competitive position and expands growth opportunities for both businesses. “The market knowledge and trend leadership for which ENK is renowned combined with the strategic and customer focus, organizational and operational expertise we have built at WSA will enable us to deliver maximum value to both sets of customers,” noted Skip Farber, WSA’s chief executive, who will continue to be a shareholder of the combined company. This is the second transaction with ENK International handled by Kathleen Thomas in the past two years. In April 2006, she acted as their exclusive financial advisor in ENK’s transaction with Forstmann Little. WSA Global Holdings LLC is the leading provider of marketing services to the global footwear and accessories industry. WSA Global’s portfolio of market access solutions includes: The WSA ShowTM, along with its luxury “show within a show,” The Collections at WSATM, is the largest and most comprehensive footwear exhibition in the world; Materials at WSATM, for the footwear supply chain, serving footwear product developers and designers; WSATodayTM and WSAToday.comTM, providing information on products and trends for retailers and buyers in print and online; and the shoebookTM, the comprehensive online database connecting brands and retailers. For more information, visit www.wsashow.com. ENK International provides the forum for the fashion world to conduct business. It is the leading tradeshow organization serving the upscale fashion marketplace, including the men’s, women’s, accessories, footwear, and children’s categories. Founded in 1981 by Elyse N. Kroll, the Company conducts 22 events per year, 16 of which are held in New York City, and five in Los Angeles. ENK events are attended by critical fashion retailers, representing both specialty and department stores from around the world. They represent over 9,000 domestic and international exhibiting companies, and over one million net square feet of exhibit space. For more information, visit: www.enkshows.com. About Forstmann Little & Co. Since 1978, Forstmann Little has made 30 acquisitions and significant equity investments, returning billions of dollars to its investors. The firm’s best-known investments include Gulfstream Aerospace, General Instrument and Ziff-Davis Publishing. The firm currently holds substantial ownership interests in Citadel Broadcasting (NYSE:CDL), a leading radio broadcaster in mid-sized markets, 24 Hour Fitness, the world’s largest fitness center company, and IMG Worldwide, the world’s premier sports, entertainment and media company and the owner and producer of New York’s Mercedes Benz Fashion Week, as well as ENK International. Buyer Parent: Forstmann Little & Co.